As technology continues to advance, the lives of seniors continue to get a little easier. Scientists have designed plenty of senior-friendly gadgets and wearable tech. 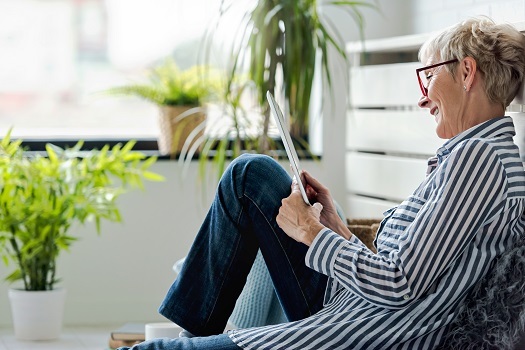 While some of these items are expensive, complicated, or still in beta-testing, there are plenty of simple, readily available gadgets for seniors. These lights were first implemented to conserve energy in office and industrial environments. They were quickly adopted by consumers as well, and they’re popular among seniors with mobility issues and dementia. When lights are motion activated, seniors don’t have to walk to the light switch to turn them on or off. Seniors are also spared from having to remember where switches are located in each room, and they don’t have to fumble with switches if they need to use the bathroom at night. Navigating the home can be challenging for seniors with limited mobility, dementia, or other serious health issues. Rhode Island in-home care professionals can be a wonderful boon to seniors. Whether they require around-the-clock supervision or just need assistance with exercise and household tasks a few days a week, seniors can enjoy a higher quality of life with the help of trusted in-home caregivers. For book-loving seniors, e-readers are a game changer. Almost every model, from the iPad to the Kindle, allows readers to increase the font size, which makes it much easier for seniors with impaired vision to read their favorite books. These devices also let readers adjust contrast, which can make words easier to distinguish. When selecting an e-reader for a senior bookworm, consider the size of the tablet screen and the largest possible font size. Many seniors take multiple prescription medications every day. When the pills are large, seniors often have difficulty swallowing them. Electric and battery-operated pill grinders and splitters make it easier to cut large prescription meds down to a manageable size. Keeping up with their daily meds is a daunting task for some seniors. They might not remember to take medication each day, which can be dangerous. Many older adults are choosing to age in place, and some need a helping hand to continue living at home safely and comfortably. Luckily, there is professional live-in care Rhode Island seniors can trust and rely on. Motor coordination often decreases with age. Whether due to arthritis, osteoporosis, or dementia, seniors often have difficulty with tasks that require dexterity and motor control, which includes hitting the correct buttons on an alarm clock. Instead of using a conventional alarm clock or a smartphone alarm app, seniors can choose an alarm that responds to voice commands. For seniors with hearing loss, voice-activated alarms may not prove useful. They can try vibrating alarms to rouse them from slumber via tactile movements. For light sleepers, light-based alarm clocks are a gentle way to wake up. They gradually emit brighter light until it’s time to get up. Email and social media platforms allow tech-savvy seniors to stay in touch with friends and family across the world. For seniors with limited vision or motor control, typing emails can induce headaches. Keyboards with oversized keys make it easier for seniors to decipher individual letters. Emergency response systems have been on the market for years, but modern versions are equipped with an unprecedented amount of great technology. They come with fall detection sensors, mobile response systems, medication reminders, and much more. Many devices allow caregivers to monitor their loved one’s vitals from afar. Using technology is just one of the ways to help seniors continue to live at home independently. Many also need the assistance of a professional caregiver. One of the most challenging tasks of helping an elderly relative age in place safely and comfortably is researching agencies that provide elderly home care. Rhode Island families can turn to Home Care Assistance for reliable, high-quality in-home care for aging adults. We offer 24-hour live-in care for seniors who require extensive assistance, and we also offer respite care for family caregivers who need a break from their caregiving duties. To learn more about our premier elderly home care, schedule a call with one of our friendly Care Managers at (401) 284-0979.